Order Now! 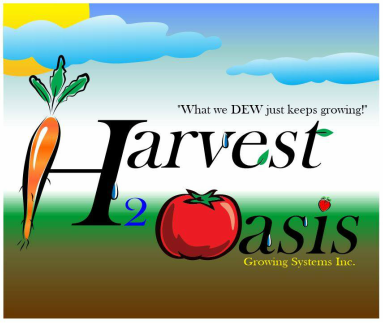 - Harvest 2 Oasis growing systems Inc.
Plan your raised bed garden, your landscape project, your desired fence/wall frame system, your home garden area, and your placement of plant types! Base your framework and design/size by considering each individual unit size of 12"W x 16"L x 10 1/2"H ~ or 1.33 square foot surface area per plant container. You must also consider the plant type and size when you are creating your plan. These individual units are designed to fit directly onto 12" or 16" centers - framework of your choosing. 2" x 8" Cedar, or natural dimensional lumber is recommended. Create a bed or frame (wall) system 2' x 4', ~ 4' x 8', ~ 12' x 24', or any combination of sizes, shapes, widths, and heights that you desire. AR SuperPots mounted directly into your deck! Most deck joists and frame are spaced on 12" or 16" centers. You simply cut your opening into the area you have selected, -prepare the base unit with soil and plant, -snap on the bottom closer plate (tray), and drop the base unit into place. You may screw or nail the unit down if you wish, but it will not be necessary (the weight of the container, soil, and plant will hold it in place) in most cases. Your order will be received and processed within 2 weeks! You will be notified by e-mail, phone, or postal service, before any product shipment, or billing is sent to you. This all new line of products is currently under construction and we anticipate a Mid- March, 2014 availability for the flagship model! AR SuperPots TM. Is ready to be placed in your gardens and landscape this spring! Start harvesting, collecting, and managing water delivery to your plants right away! You will begin to see its benefits in both design and function immediately! Currently we have ONE fantastic model to offer you at this time. This ORIGINAL, AR SuperPots TM! This model is 12"W x 16"L x 10 1/2"H (without the lotus effect funnel) and is offered with a single plant placement dome that allows for 5 or more plant placements in centralized pre-positioned (knockout) zone. This base unit may be interconnected to any range of length and width. It may be placed in your existing beds/planters, or assembled as an enclosed 2 piece unit by inverting 1 base and placing a 2nd base onto the flexible leg/reservoir structure. ~This creates an independent enclosed system that may be placed in wall systems or as a single portable container that you can use inside, outside, where ever you wish to place/move the fully self contained unit. The lotus effect funnel (UV protected TRANSPARENT) is an attachment option that will enhance the harvest and collection of both rain and dew water! Base = 1- 12"W x 16"L x 10 1/2"H (without the lotus effect funnel) and is offered with a single plant placement dome, and a single container bottom (closer tray). Suggested retail price, = $14.95 each. Suggested retail price, = $2.85 each. Suggested retail price, $15.95 each. YES!!! We will offer discounts on order requests greater than 250 minimum, base units or combo packages. Call me for your individual price quote. Place your order here, for the one and only original AR SuperPots TM! Also add your requests for product line, and company information.